James Earl &quot;Jimmy&quot; Carter Jr was born 1 Oct 1924, the eldest child of [[#James Earl Carter|James Earl Carter]] and his wife [[#Bessie Lillian Gordy|Lillian Gordy]]. Jimmy grew up in Plains, [[Sumter County, Georgia|Sumter County]], [[Georgia]]. James Earl "Jimmy" Carter Jr was born 1 Oct 1924, the eldest child of [[#James Earl Carter|James Earl Carter]] and his wife [[#Bessie Lillian Gordy|Lillian Gordy]]. Jimmy grew up in Plains, [[Sumter County, Georgia|Sumter County]], [[Georgia]]. Jimmy Carter, graduated from the U.S. Naval Academy at Annapolis, [[Maryland]], in 1946. That summer on 7 Jul 1946, he married Eleanor Rosalynn Smith (born 18 Aug 1927), who was also from Plains. Jimmy, an officer in the Navy was stationed in various locations which explains the varied birthplaces of his children. When his father died in 1953, Jimmy resigned his commission in the Navy, returning to Plains, Georgia to run the family peanut farm. #John William &quot;Jack&quot;, b. 3 Jul 1947 in Portsmouth, [[Virginia]]. #John William "Jack", b. 3 Jul 1947 in Portsmouth, [[Virginia]]. #James Earl III &quot;Chip&quot;, b. 12 Apr 1950 in Honolulu, [[Hawaii]]. #James Earl III "Chip", b. 12 Apr 1950 in Honolulu, [[Hawaii]]. #Donnel Jeffrey &quot;Jeff&quot;, b. 18 Aug 1952 in New London, [[Connecticut]]. #Donnel Jeffrey "Jeff", b. 18 Aug 1952 in New London, [[Connecticut]]. #Amy Lynn, b. 19 Oct 1967 in Plains, Georgia. Jimmy Carter was elected Governor of Georgia in 1970. 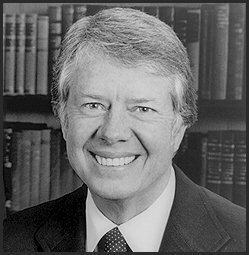 Jimmy Carter a &quot;wealthy peanut farmer&quot; ran for president of the [[United States]] and was elected 39th president in 1976, serving from 1977 until 1981. His vice-president was Walter F Mondale of Minnesota. Under Carter's presidency, large strides were made in Middle East peace, he being instrumental in normalizing relations between Egypt and Israel, but also the United States saw some of the highest interest rates recorded this century. Jimmy Carter was elected Governor of Georgia in 1970. Jimmy Carter a "wealthy peanut farmer" ran for president of the [[United States]] and was elected 39th president in 1976, serving from 1977 until 1981. His vice-president was Walter F Mondale of Minnesota. Under Carter's presidency, large strides were made in Middle East peace, he being instrumental in normalizing relations between Egypt and Israel, but also the United States saw some of the highest interest rates recorded this century. *[http://search.ancestry.com/cgi-bin/sse.dll?indiv=1&rank=0&gsfn=&gsln=Carter&sx=&f12=Georgia&f4=Sumter&f7=&f15=&rg_81004011__date=1925&rs_81004011__date=1&f18=&f14__n=&_8000C002=&_80008002=&_80018002=&f10=&f16=&gskw=&prox=1&db=1930usfedcen&ti=0&ti.si=0&gss=angs-d&fh=15&recid=17813839&recoff=3+19+20 1930 Census of Sumter County, Georgia] showing : "Earl Carter 35 b GA, owns home, married first at 29, Farmer; Lillian 31 b GA, married first at 25; Jim E 5 b GA; Gloria 3 4/12 b GA; Ruth 4/12 b GA"
This page has been accessed 51,593 times.